There’s always something rejuvenating and satisfying about coming home. Coming back to the place where the journey started. 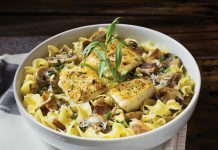 So, it’s no surprise that in 2011, when Scott Dallimore moved the family business back to the same spot where his Dad launched the operation in 1962, it would be the start of an aggressive rebuilding process, driven by a “back-to-basics” approach. 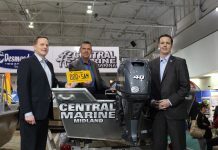 This isn’t to say that Sandy Cove marine doesn’t sell boats. Dallimore tells me their consignment sales division is quite popular. 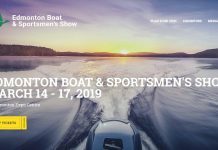 Their on-site fiberglass repair and restoration department ensures a steady flow of quality used boats crossing the lot in search of new homes. 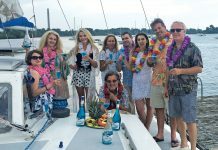 The opportunity has presented itself several times for Sandy Cove Marine to take on a new line of boats, but Dallimore has turned down the chance, preferring to focus on serving existing boaters. 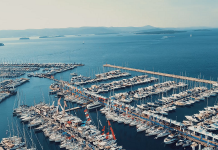 Without the added overhead from a new sales department, the result is a marine facility with a singular focus on service work. 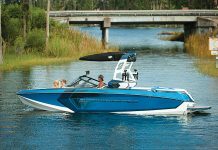 Sandy Cove’s marine technicians are certified by Mercury, MerCruiser and Volvo Penta. The facility is an authorized service center for all three brands, meaning they can handle warranty work. 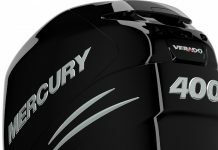 If you’re in search of a repower, Sandy Cove is also a Mercury Outboard retailer, with access to the full lineup of outboard engines. 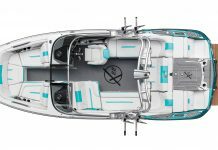 The service bays are outfitted to repair anything from a tin boat to a cabin cruiser. 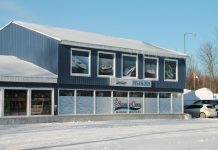 Sandy Cove continues to offer pickup and delivery services to its customers and can also handle remote repair work if you can’t get your boat to the shop. 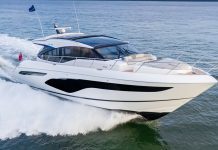 Complex repairs like engine or drive rebuilds are handled in-house by Sandy Cove’s team of experienced marine technicians. 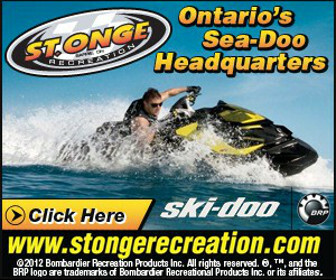 Despite being land-locked, Sandy Cove maintains its own private launch facility on the western shore of Lake Simcoe. 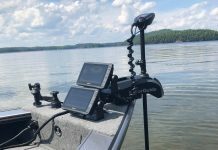 Dallimore says this allows them to service their on-water customers quickly and more efficiently by providing unrestricted access to the water, even in the peak of boating season. The parts and accessories store is a highlight of the new location. If they don’t have the part you need in stock, they can have it next-day in most cases. This is a key element for a service-focused operation. 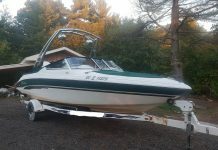 There’s nothing a boater with a broken boat hates to hear more than the phrase “we’re just waiting on the parts”. 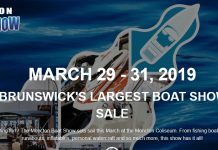 They also maintain a large selection of quality used parts, along with their ever-popular “Boaters Flea Market”, a cornucopia of boating odds-and-ends that might just have the hard-to-find piece you’re after. As good as the parts department is, the accessories section is even better. 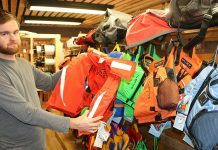 From safety equipment to watersports gear and cottage toys, Sandy Cove has it in stock. 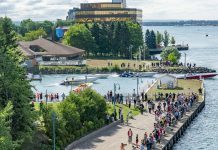 There are water skis and wakeboards from Connolly, watercraft and paddle boards from Emotion Kayaks, paddleboats, inflatables, towables and a huge selection of trailer accessories. Sandy Cove is also a LoadRite dealer, maintaining an on-site inventory of the most popular models in the LoadRite lineup. 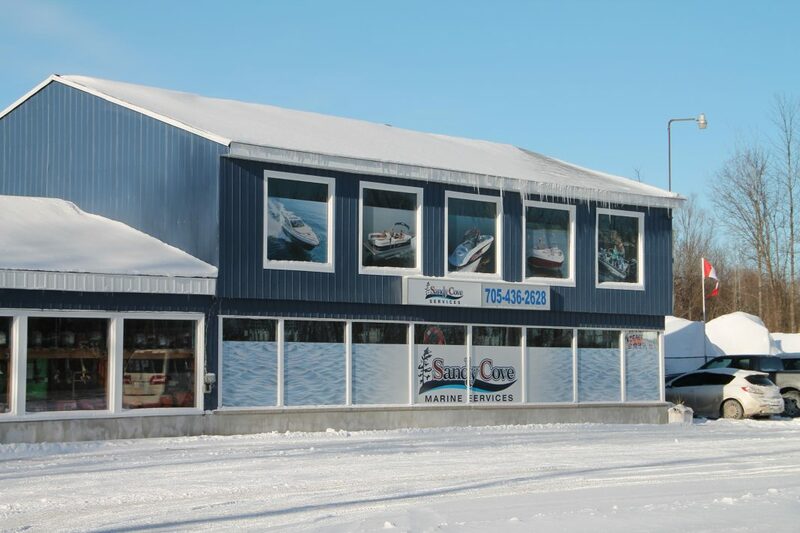 No marine service center in Ontario would be complete without winter storage. Sandy Cove features an outdoor area for larger boats and cruisers. 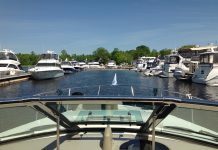 Their covered racks are ideal for day boats. 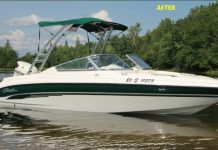 A full winterization and a shrink-wrap service are both available before your boat is put to bed for the winter. 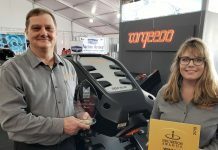 As a testament to their full-service philosophy, Sandy Cove is now offering repair and service to snowmobiles and ATV’s. Their close relationship with nearby Royal Distributing ensures they have quick, easy access to everything they need to keep you out on the trails. 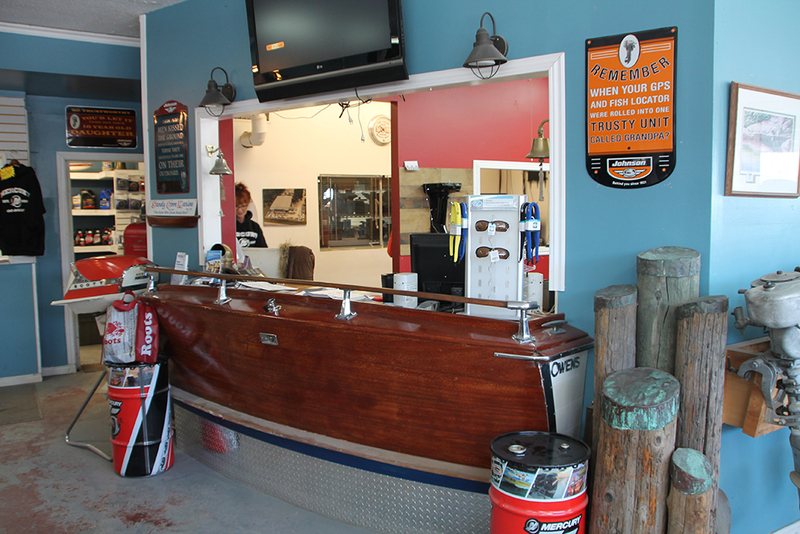 Dallimore tells me their goal was to create “a good, old-fashioned boat store”. One of those places you hear about where the customers are family, the coffee is always hot, and they’ve got the parts, accessories, and advice you need when you need it. Mission accomplished.